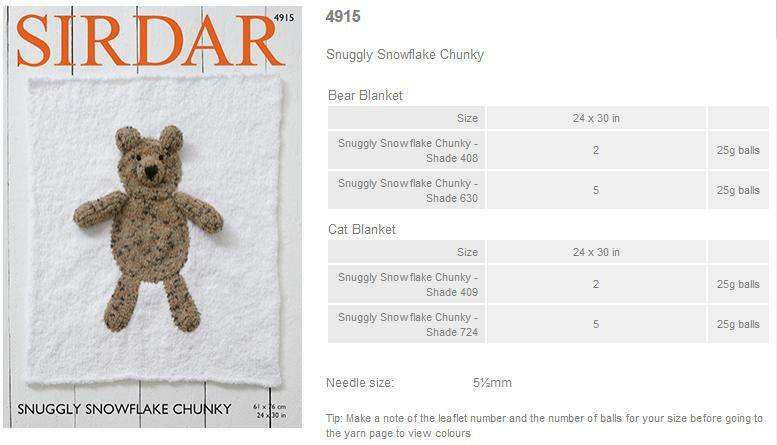 4915 - Bear and Cat Blankets using Snuggly Snowflake Chunky Leaflet with designs for Bear and Cat Blankets using Snuggly Snowflake Chunky. 4914 - Hoodie using Snuggly Snowflake Chunky Leaflet with a design for a Hoodie using Snuggly Snowflake Chunky. 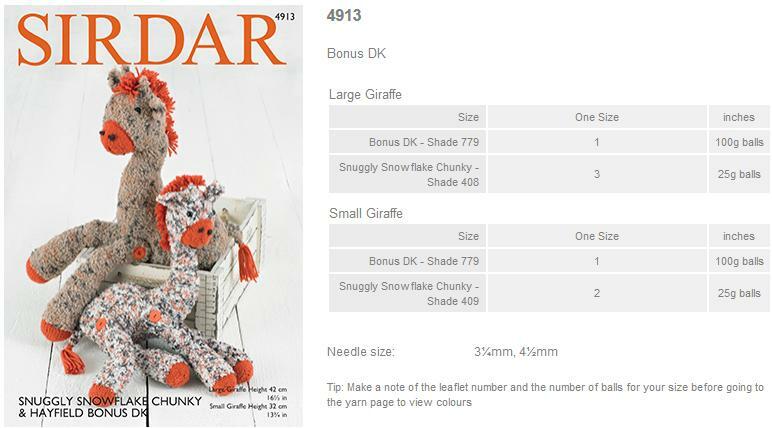 4913 - Large and Small Giraffes using Snuggly Snowflake Chunky Leaflet with designs for Large and Small Giraffes using Snuggly Snowflake Chunky. 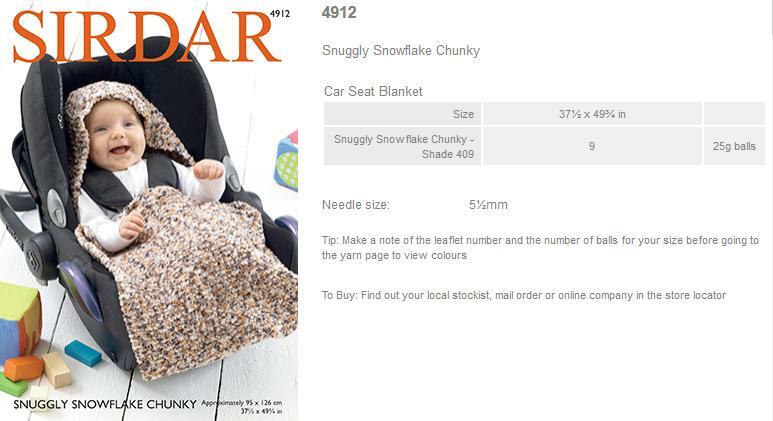 4912 - Car Seat Blanket using Snuggly Snowflake Chunky Leaflet with a design for a Car Seat Blanket using Snuggly Snowflake Chunky. 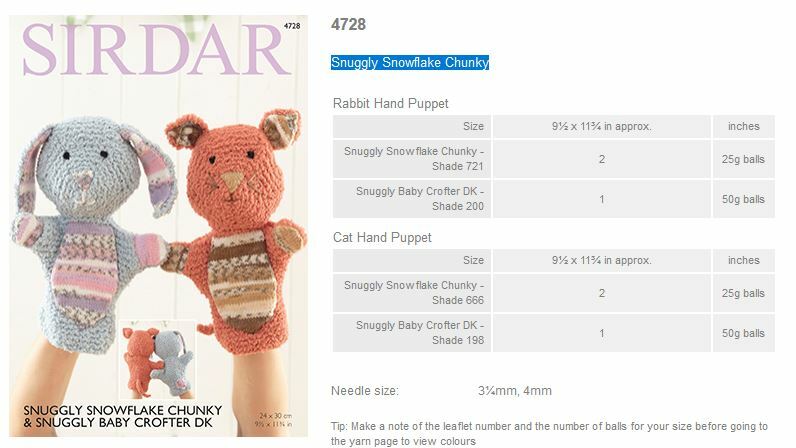 4728 - Rabbit hand puppet and Cat hand puppet using Snuggly Snowflake Chunky Leaflet with designs for a Rabbit hand puppet and Cat hand puppet using Snuggly Snowflake Chunky. 1961 - Cardigan & Helmet Leaflet with designs for a Cardigan & Helmet using Snuggly Snowflake Chunky. 1960 - Jacket & Waistcoat Leaflet with designs for a Jacket & Waistcoat using Snuggly Snowflake Chunky. 1959 - Long and short sleeved Bolero Leaflet with designs for Long and short sleeved Boleros using Snuggly Snowflake Chunky. 1884 - Cardigan and Hat Leaflet with designs for a Cardigan and Hat using Snuggly Snowflake Chunky. 1883 - Bodywarmer with Round Neck and Shawl Collar Leaflet with designs for a Bodywarmer with Round Neck and Shawl Collar using Snuggly Snowflake Chunky. 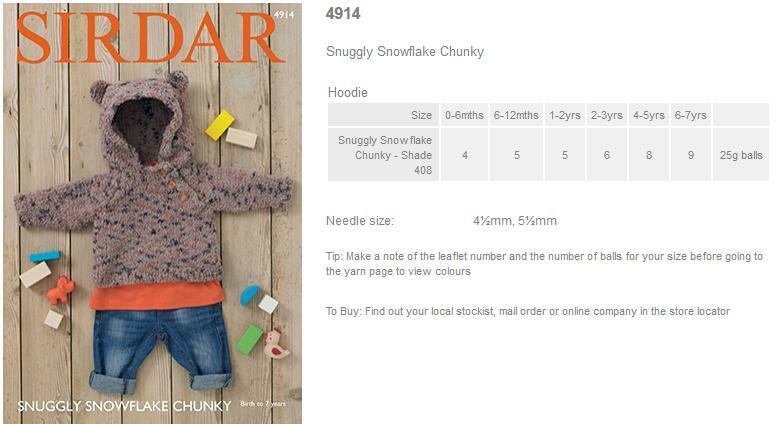 1882 - Hooded Cardigan and Bootees Leaflet with designs for a Hooded Cardigan and Bootees using Snuggly Snowflake Chunky. 1810 - Bolero with frill and ribbed borders Leaflet with designs for a Bolero with frill borders and a Bolero with rib borders using Snuggly Snowflake Chunky. 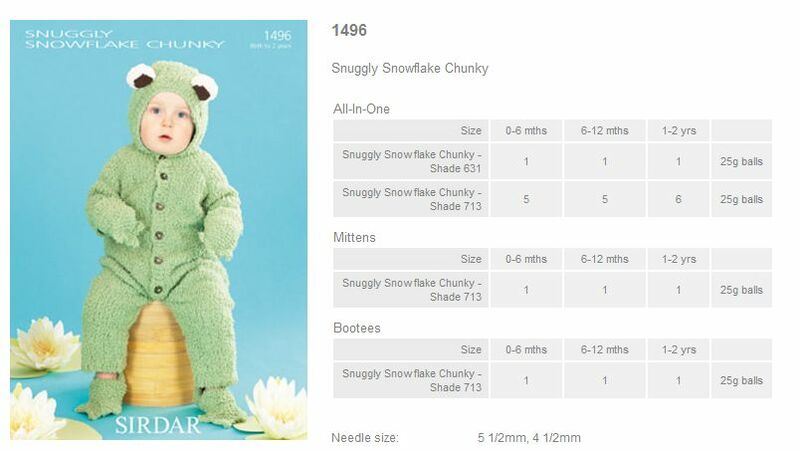 1809 - Short and long-sleeved Bolero Leaflet with designs for a short and long-sleeved Bolero using Snuggly Snowflake Chunky. 1808 - Cardigan with contrasting edges Leaflet with a design for a Cardigan with contrasting edges using Snuggly Snowflake Chunky. 1775 - Cardigans with Round-Neck, V-Neck, and Collar Leaflet with designs for Cardigans with Round-Neck, V-Neck, and Collar using Snuggly Snowflake Chunky. 1774 - All-in-one with mittens Leaflet with a design for an all-in-one with mittens using Snuggly Snowflake Chunky. 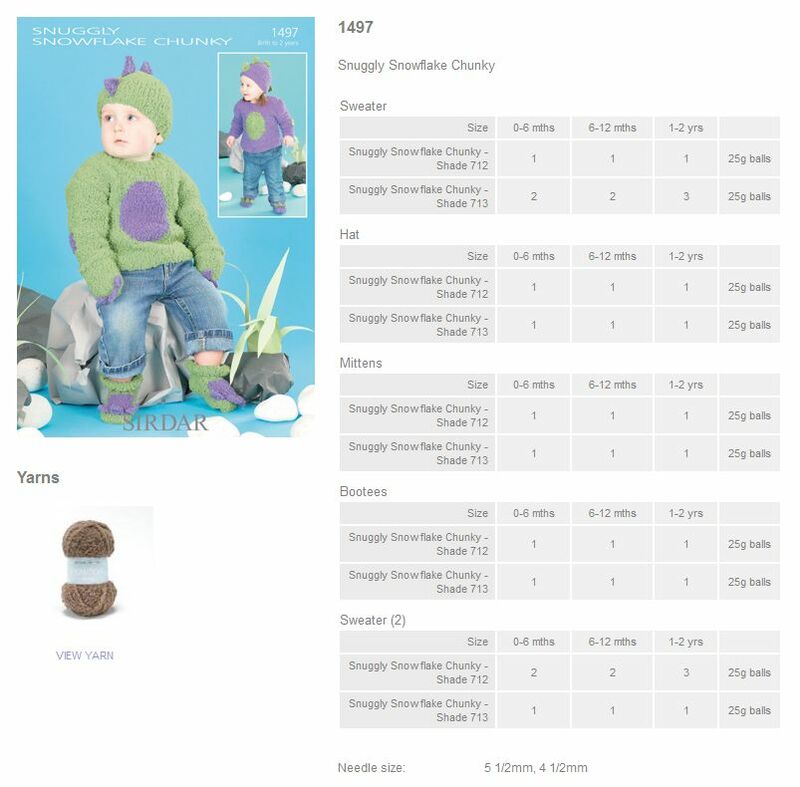 1773 - Sweater, Pull-On Hat, Square Hat Leaflet with designs for a Sweater, a Pull-On Hat, and a Square Hat using Snuggly Snowflake Chunky. 1772 - Plain Cardigan, 2-Colour Cardigan, Hat, Flower Leaflet with designs for a Plain Cardigan, a 2-Colour Cardigan, a Hat, and a Flower using Snuggly Snowflake Chunky. 1771 - Blankets Leaflet with designs for a plain blanket, a blanket with flower, a blanket with frill, and a blanket with squares using Snuggly Snowflake Chunky. 1496 - All-In-One, Mittens and Bootees using Snuggly Snowflake Chunky Leaflet with designs for an All-In-One, Mittens and Bootees using Sirdar Snuggly Snowflake Chunky. 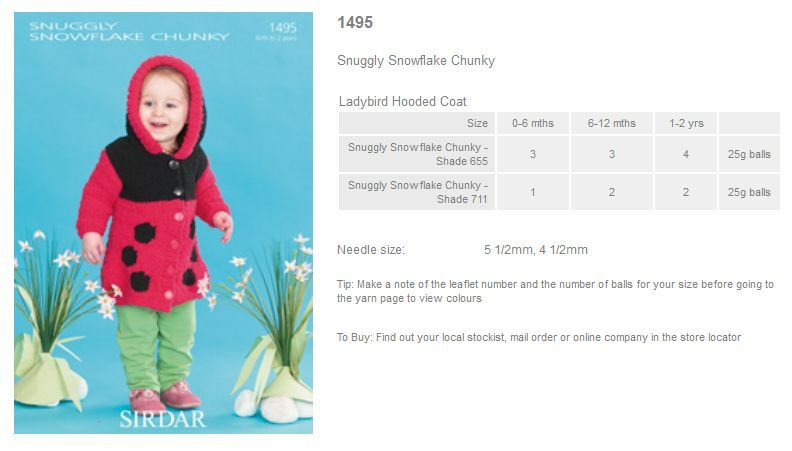 1495 - Ladybird Hooded Coat using Snuggly Snowflake Chunky Leaflet with designs for a Jacket using Sirdar Snuggly Snowflake Chunky. 1497 - Sweaters, a Hat, Mittens, and Bootees using Snuggly Snowflake Chunky Leaflet with designs for Sweaters, a Hat, Mittens, and Bootees using Sirdar Snuggly Snowflake Chunky. 1453 - Leroy The Lamb using Snowflake Chunky Leaflet with designs for Leroy The Lamb using Sirdar Snuggly Snowflake Chunky.